In this month's edition of How To Fix, we ask the experts for their thoughts on horses who are fearful of needles. As with humans, some have a particularly negative reaction to vaccines or medication injections, which can be dangerous for veterinarians and handers. We wondered whether it's possible to break this cycle of apprehension. Dr. Katherine Houpt, professor emeritus of behavioral medicine at Cornell University's College of Veterinary Medicine: Once a horse gets that way, it's hard to correct it. I've had to stick needles into hundreds of horses and they always got a reward after I took the needle out of their necks. That really helps, simple as it seems. If the horse has already developed a phobia, I like to give the example of conditioning in horses. We all know Pavlov's dogs learned a bell predicted food, so they would salivate. Horses have learned that truck in the driveaway means pain, so as soon as they see the vet truck, they're already reactive and fearful. Dr. Sue McDonnell (at University of Pennsylvania) had a really terribly needle-shy horse and she would start by coming in with a small bucket, and in the bucket was a small syringe with some grain, so the horse got used to seeing syringe as he was eating. Then she would hold the syringe against the horse's neck, and again he got grain. Then she would have a needle, but with a cap on the needle, and she would put that by the neck. Then she could actually insert the needle, and she started with a very small gauge needle, not a 14 gauge but a 21 gauge. The horse would learn the prick was followed by food. The owner can do that in the faint hopes it will work when the vet wants to take a blood sample. Dr. Bryan Waldridge, internal medicine specialist at Park Equine Hospital: That's a good question. I've never tried it but there's a research study (published in 2001 in the Journal of the American Medical Association and summarized here) saying if you use frozen needles, they don't hurt. I've always wanted to try it. It was a human paper, as I recall. I thought that was an interesting approach. There's kind of two schools of thought on needle shy horses. I'm of the school that I want to do it fast: I'll stick them the way I want to get stuck, because I don't like needles, either. I'd want someone to stick me quick and get it over with. Some people, if you're going to do an intramuscular shot, prefer pinching the skin and putting the vaccine under the skin pinch. But one thing I've seen with that is when you're trying to check a horse's hydration, they'll flinch because they think you're going to give them a shot when you're actually just checking to see if they're dehydrated. I will rub on them. I think desensitizing them in that spot helps if they're a real needle-shy horse. Just scratch them where you're going to stick them just to try to counter the idea that something's going to happen. I think that helps. Smaller gauge needles, I don't think that makes much difference on them. Covering the eye sometimes works ok. Twitching or gum chaining I sometimes think makes things worse. Switching sides of the neck sometimes helps — I got a concussion from a horse one time that wouldn't let you inject the left side of his neck but you could jab it on the right side and it was fine. He threw his head and bashed me in the head pretty good. The new detomidine gel has worked really well for me. I used to have a horse that I was actually afraid of, and you had to give him three tubes of detomidine gel just to vaccinate it, but it helped a lot. If you had a horse that you had to vaccinate, I'd give it, leave them alone for 40 minutes, which is what the label says to do, and then go back and mess with them. 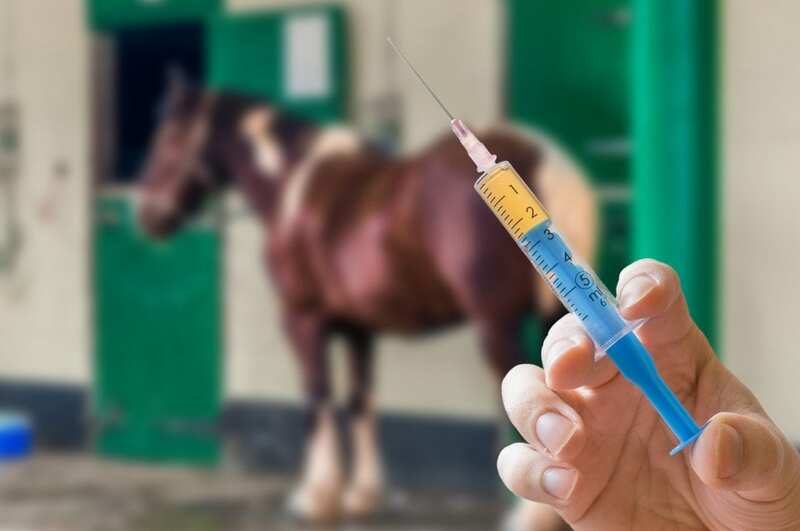 Why do some horses get more upset about needles than others? I think it's just like people, some of them probably hate it more than average, and some of them probably had some bad experiences getting stuck, if I had to guess — they had a bad stick or had to get stuck a lot to get blood. If they've been on procaine penicillin for a while, that'll do it to them for sure [because it burns at the injection site]. And that's got to be a big 18 gauge needle too, because if you don't, you're there forever giving it. And then you can't put it all in one spot, you've got to redirect. That injection is a lot more traumatic, both psychologically and physically than a lot of things you can give. Luke Sullivan, broodmare manager, Mt. Brilliant Farm: In my mind, it's all about the experience for the horse. If you know you have a horse that's not a big fan of injections, you just go about it slowly. If you have a good handler on the head of the horse, you sometimes can block their eye so they can't see the injection coming. I have a specific way I will gab the neck to blow the vein up a little bit for injections, and if a horse doesn't like injections, if they feel you even coming anywhere near them, they start to shy away or blow their nostrils up and back up on you. There's a couple different ways to restrain a horse that's really tough—you can put a twitch on a mare or a young horse — but for me it's really about the handler and how they're holding the horse. A lot of times we'll grab what we call a shoulder roll, the excess skin on their shoulder, and we're roll it over kind of in a fist. That takes their attention away from the shot and makes them focus on something else. If you can take their focus away from the injections, that's probably your best bet. This entry was posted in Horse Care, How To Fix, NL List and tagged dr. bryan waldridge, dr. katherine houpt, equine behavior, horses afraid of needles, how to fix, luke sullivan, Mt. Brilliant Farm, needleshy horses by Paulick Report Staff. Bookmark the permalink.